(also known as Perry’s Handbook or Perry’s) was first published in 1934 and the most current eighth The subjects covered in the book include: physical properties of chemicals and other materials; mathematics; thermodynamics; heat transfer; mass transfer; fluid dynamics; chemical reactors and chemical reaction kinetics; transport and storage of fluid; heat transfer equipment; psychrometry and evaporative cooling; distillation; gas absorption; liquid-liquid extraction; adsorption and ion exchange; gas�solid, liquid�solid and solid�solid operations; biochemical engineering; waste management, materials of construction, process economics and cost estimation; process safety and many others. An electronic version of his reference book is provided by Knovel. The first edition was edited by John H. Perry who was a PhD physical chemist and chemical engineer for E. I. du Pont de Nemours & Co. W. S. Calcott (ChE) of DuPont was his assistant editor. It was published in 1934. The second edition was published in 1941. The third edition was edited by John H. Perry and published in 1950 The fourth edition was edited by Robert H. Perry, Cecil H. Chilton, and Sidney D. Kirkpatrick and published in 1963. The fifth edition was edited by Robert H. Perry and published in 1973. The sixth edition was published in 1984 and edited by Robert H. Perry and Donald W. Green. The 1997 seventh edition was edited by Robert H. Perry and Donald W. Green. 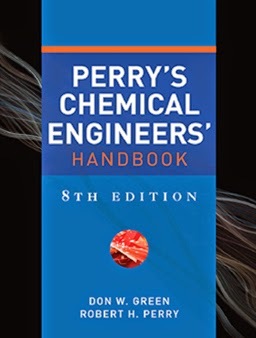 The 2007/2008 eighth edition was edited by Don W. Green and Robert H. Perry.